Sunday February 16th around 6 am. I let the dog out back and he started barking like crazy. He ran to the back forest boundary and kept barking. I followed him back there and saw a small Coyote. The Coyote didn't seem too fazed by the barking or attention. He just went about his business and trotted away. About 1 hour later I saw a much bigger Coyote by Sherwood Forest Baseball diamonds, out in one of the adjacent soccer fields. I have been living in this area for over 15 yrs and had never seen a Coyote before. 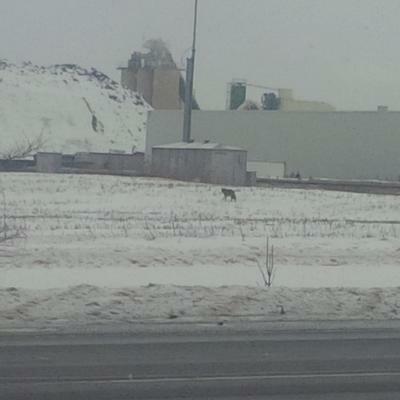 I do have a picture of the larger Coyote but it was taken from a car and it isn't very clear. Two more coyotes this morning. Monday Feb 24 2014. I am quite surprised, with the loss of snow cover that they would still come this close to the houses.